Induction, ceramic and gas cooktops. Find out which type of cooktop will best suit your needs, the features to look for, and compare test results for all 3 types. 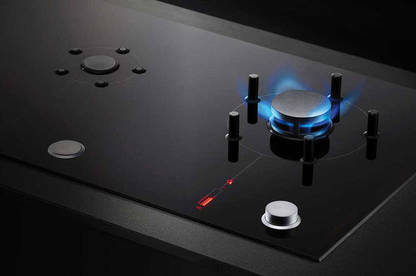 Snapshot: The Whirlpool AKT809BA ceramic cooktop has 4 elements and touch controls. How well does it cook? Snapshot: The Robinhood Alto HGAA604FKSS gas cooktop has 4 burners and flame-failure protection. How well does it cook? Snapshot: This gas cooktop has medium, simmer and wok elements and flame-failure protection. How well does it cook? 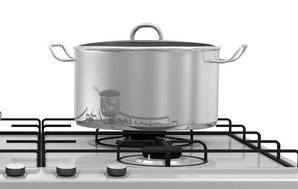 Snapshot: This gas cooktop has medium, large, simmer and wok elements and flame-failure protection. How well does it cook? Snapshot: The Fisher & Paykel CE604CBX1 ceramic cooktop has 4 elements, and dial controls. How well does it cook? Snapshot: The Fisher & Paykel CE604DTB1 ceramic cooktop has 4 elements, and touch controls. How well does it cook? Snapshot: The Fisher & Paykel CE754DTB1 ceramic cooktop has 4 elements and touch controls. How well does it cook? Snapshot: The Fisher & Paykel CG604DNGGB1 gas cooktop has 4 burners and flame-failure protection. How well does it cook? Snapshot: The Fisher & Paykel CG604DX1 gas cooktop has 4 burners and flame-failure protection. How well does it cook? Snapshot: The Blanco CG604WXFFC gas cooktop has 4 burners and flame-failure protection. How well does it cook? Snapshot: The Fisher & Paykel CG905DNGGB1 gas cooktop has 5 burners and flame-failure protection. How well does it cook? Snapshot: The Fisher & Paykel CG905DX1 gas cooktop has 5 burners and flame-failure protection. How well does it cook? Snapshot: The Blanco CG905WXFFC gas cooktop has 5 burners and flame-failure protection. How well does it cook? Snapshot: The Fisher & Paykel CI604CTB1 induction cooktop has 4 cooking zones but there’s no auto heat-up. How well does it cook? Which type of cooktop will best suit your needs? Turn the heat off a radiant-ceramic element that's been on full for a few minutes and it takes some time for the element to cool. Turn off a gas flame and the heat's gone. Professional chefs overwhelmingly use gas for stovetop cooking because it gives them better and more responsive control over the heat. If you're at all adventurous with your cooking, gas is likely to suit you better. Induction cooktops may offer the best of both worlds: the sleek good looks of ceramic cooktops with the speed and instant control of gas cooking. They heat up incredibly quickly, transferring energy to the cookware faster than any other method of cooking. Induction cooktops are also excellent from a safety perspective: since the element itself does not get hot, it’s safe to touch unless you’ve had a hot pan on it for a while. With any cooktop, you need to consider installation issues – adequate ventilation and connection to power and fuel supplies. With induction cooktops you also need to invest in new cookware – the cookware used on induction cooktops must be made of ferrous (iron) materials. Pots and pans also need to be within, or close to, the diameter of the elements. Cookware that overhangs won’t heat properly around the edges, and pans that are too small won’t be recognised. We’ve covered what you need to know before you buy. If you’re installing a new cooktop, we recommend getting a quote for installation before buying one – especially if you’re moving from a radiant-ceramic cooktop to an induction or gas cooktop. Electrolux is the Top Brand for cooktops. The Top Brand award recognises brands that perform consistently well across product testing, reliability and customer satisfaction. We asked our members about their cooktops to find out which brand is most reliable. The same test method was used for all 3 types of cooktop. In addition, ceramic cooktops were tested for chocolate-melting. First we make white sauce on the simmer-burner or element with the lowest setting. This tests the cooktop’s ability to perform at a low temperature for a long time. Next we cook rice on the medium-sized burner or element. This tests the "turn down" capacity of the hob and whether the cooktop can maintain a suitable heat at the lowest temperature setting. We then use a beef and vegetable stir-fry to see whether the cooktop can deliver continuous high heat. We also assessed the ease of use and cleaning of each cooktop. Many cooks prefer gas because it gives instant heat control and the flame shows how hot the burner will be. It's also great for wok cooking. But parts of the country don't have a piped-in natural gas supply. Even where gas is an option, getting connected can be very expensive. The alternative is liquefied petroleum gas (LPG), which can be supplied in twin 45kg bottles attached to the outside of the house and reticulated inside. If you use gas only for your cooktop, the most cost effective option is to hook it up to a small 9kg cylinder, installed outside the house where practicable, or in a cupboard next to the cooktop. When the gas runs out, you can get it refilled at a service station. If the cylinder is installed inside it's very important that the cupboard is adequately vented to the outside, the doors are well sealed and that there are no electrical sockets or switches inside the cupboard. The hose and fittings must be LPG-approved. Brush a solution of water and dishwashing liquid on the connections each time you reconnect the cylinder after refilling. 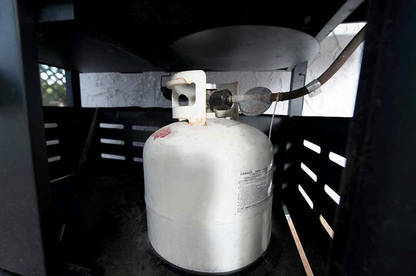 If bubbles appear, LPG is leaking. If you're likely to want to change fuels, say from natural gas to LPG, check whether the model you're interested in can be converted after purchase. A licensed gasfitter must perform the conversion for you and should provide a certificate of compliance and gas safety certificate as a minimum. Some work may be deemed high risk in certain situations and will also need to be added to the risk register. Gas and ceramic — best of both worlds? Fisher & Paykel's Izona CookSurface claims to combine the performance of a gas cooktop with the easy-to-clean convenience of a ceramic top. So what do you get for almost $4000? You certainly get good looks. The 3 "hidden" burners, the pan supports (not conventional trivets) and the control dials all sit flush with the sleek black top. When you push the control dial the burner and pan supports rise; and the burner ignites at the same time. Once cooking is finished and the surface cools, the burner and the supports automatically retract. You also get extra features like a child lock ... and beeps and lights when you push buttons and turn dials. The 3-in-a-row layout of the burners means no reaching over a hot pot to get to one at the back. But it also means only 3 burners compared with 4 or 5 on the other cooktops. It's not as easy to clean as a regular ceramic cooktop. 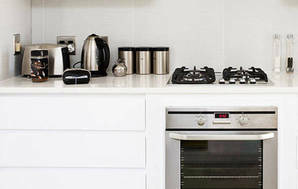 Cleaning can be fiddly with 5 separate pieces around each burner to remove, clean and replace. The pan supports must be kept clean, too, so that they can retract properly. As well, the cooktop's flat surface allows spills to run on to the bench – and there are no seals around the controls to stop spills from running into the workings.